Plot: Hundreds of years ago, Inuyasha`s father, the great Inu-No-Taisho, battled a powerful Chinese Moth-demon called Hyoga whom was intent upon invading Japan. Inu-No-Taisho sealed Hyoga away inside an enormous tree with one of his claws, and destroyed Hyoga`s entire Demonic army. Years later, a shard of the Shikon jewel strikes the tree, bringing Hyoga`s son, Menomaru, back to life. Unable to take his birth-right, the power of all of his ancestors that his father had before him, Menomaru set out to break the seal of the tree the only way possible, by using the power of Inu-No-Taisho himself. After discovering the only trace left of the great dog demon was his two son`s and their swords, Menomaru sent his minions to attack Inuyasha and Sesshomaru. Sesshomaru killed the minions quickly, and Menomaru relized that his sword was not the one he needed. After kidnapping Kagome, enslaving Kirara, and tricking Inuyasha into releasing the power of Hyoga, Menomaru begins to drain the souls of all the people of Japan. 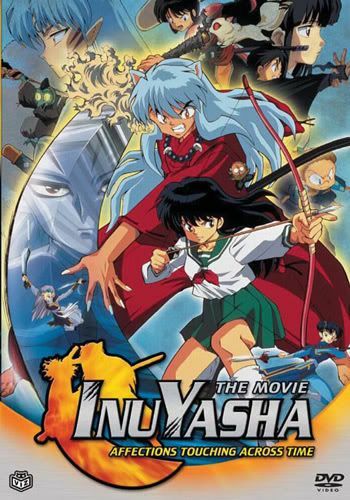 Can Inuyasha stop the evill villian, or will he lose all those dear to him? Find out in "Inuyasha: Affections Touching Across Time".